Cerebral palsy is not actually a single disability or disorder. Cerebral palsy is actually a blanket term which is used to reference a collection of different muscle movement disorders that are the result of damage to the brain during pregnancy or childbirth. The various movement disorders within the cerebral palsy umbrella are classified into different types based on clinical characteristics. There are currently 4 established types of cerebral palsy: (1) spastic (2) dyskinetic (3) ataxic (4) mixed. This page will focus on the unique characteristics and symptoms of ataxic cerebral palsy. The root word "ataxia" means lack or order or coordination. Individuals afflicted with this type of cerebral palsy have impaired depth perception and suffer from a lack of balance and coordination. The impaired coordination of ataxic CP is usually most noticeable in the arms and legs. Ataxic CP is the rarest subtype of cerebral palsy. 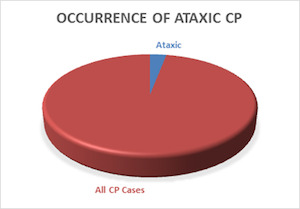 Only around 3-5% of cerebral palsy cases are classified as ataxic CP. The most distinctive features of ataxic cerebral palsy are lack of muscle tone (hypotonia) and lack of body coordination. The hypotonia associated with ataxic CP is most noticeable in the first 6-12 months after birth. Infants with hypotonia from ataxic CP will often exhibit "rag doll" symptoms in which their bodies are abnormally floppy. Usually children with ataxic CP develop increased muscle tone as they grow older but never really reach normal levels. As a child with ataxic CP grows and becomes a toddler, their most noticeable symptom will usually be the absence of coordination and balance. Kids with ataxic CP frequently suffer from what are called "intention tremors" when the arms or hands shake and tremor when a reaching or attempting a specific movement. In the legs and lower body ataxic CP often causes individuals to walk with an awkwardly wide gait with the feet wider than the hips. Children with severe cases of ataxic CP are often not able to walk independently and require a wheelchair or mobility aid. Ataxic CP can also in impair oral and facial control. This can cause difficulties with chewing and swallowing. Oral impairment from ataxic CP also causes a specific type of speech impairment sometimes called "scanning" speech. Individuals with scanning speech sound very monotone with heavy breathing. They also tend to have an abnormal rhythm to their speech with extended pauses and sudden accelerations. Ataxia can also impair eye movement and control. People with ataxic CP are often not able to quickly shift their eyes to a new point of focus. The focus of the eyes will frequently undershoot or overshoot the object and have to catch up. In addition to physical movement impairment, a large percentage of children with ataxic cerebral palsy will also suffer from cognitive impairment and developmental delays. Like all other types of cerebral palsy, ataxic CP is usually the result of damage to cells in the brain during its earliest developmental phases in pregnancy and childbirth. The human brain needs constant oxygen to maintain itself. When deprived of necessary oxygen for even a short amount of time cells in the brain quickly die and can never regenerate. This type of brain cell damage from oxygen deprivation is what ultimately causes all types of cerebral palsy. The oxygen deprivation most often occurs at some point during the labor and delivery process. Until a baby is actually born and starts breathing on their own, they are dependent on the placenta and umbilical cord for continued oxygen supply. During the stressful process of childbirth, the baby's oxygen supply can frequently become disrupted by various events or complications. This is why oxygen deprivation during childbirth is a leading cause of ataxic CP. Complications and/or events during labor and delivery that can potentially result in ataxic CP include: umbilical cord problems; delayed C-section delivery; shoulder dystocia; vacuum and forceps delivery errors; and other events which result in prolonged, stress delivery. Ataxic CP can also be caused by oxygen deprivation earlier on during pregnancy. Prenatal events and complications that can potentially damage the baby's brain and cause ataxic CP include: developmental defects; maternal infection; and prenatal asphyxia. Cerebral palsy is a permanent condition. Once the damage to the brain which causes ataxic CP occurs, it cannot be fixed or repaired. 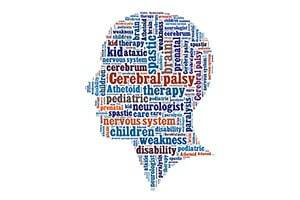 There are, however, a host of treatment options to help manage the most types of cerebral palsy. Unfortunately, ataxic cerebral palsy is probably the least treatable of the 4 CP types. The primary symptom of spastic CP (muscle stiffness / hypertonia) can be effectively minimized in some cases with surgery and/or medications. Sadly, however, there currently are no effective or widely utilized treatments for ataxia. Even though there are no drugs or surgeries to help children with ataxic CP, there are still a host of highly beneficial therapeutic treatment options. Regular physical therapy programs can develop increased body control and enable children with ataxic CP to walk independently. Fine motor skills such as writing or zipping up a jacket can be enhanced with occupational therapy.